West Ham are above Liverpool in the Premier League table and go to Anfield this weekend looking for a result that will keep them there and still in contention for a top-four finish. But it’s been a long time since West Ham won a league match at Anfield. A long, long, long, long, long, long time. 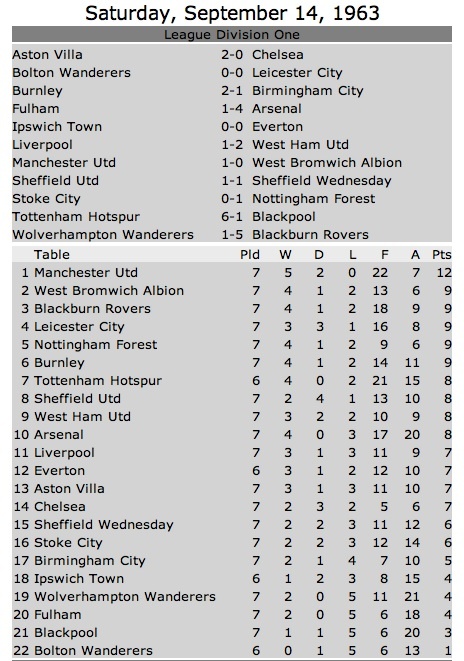 The last time West Ham won there, The Beatles were at No1 in the charts with She Loves You. The average house price in Britain was £3,160 and the average weekly wage was £18.46, or £960 per year. The average footballer’s wage in England’s top division was £29 per week, or £1,508 a year, as opposed to a figure north of £2.2m per year now as can be seen on page 17 of the report linked here. Since that league win in 1963, West Ham have made 41 league visits to Anfield, losing 30 of them and drawing 11. 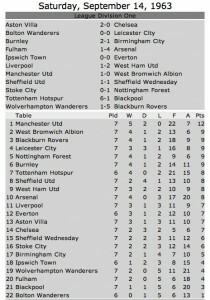 In those games, the Hammers have conceded 85 goals and only scored 16 themselves. Within the Premier League era alone (the ‘monied era’ since 1992-93), West Ham have played 18 Premier League games at Anfield, losing 13 of them and drawing five while conceding 37 goals and scoring just five. Let’s not pretend that it is easy to go and win at Anfield. It’s not. Liverpool have played 435 Premier League home games there since 1992 and have won 265 of them (61%), drawn another (25%) and lost just 63 of them (14%). That has helped Liverpool to win 902 Premier League home points in the era, a figure that has only been bettered in the same 23-year period by only Manchester United Utd (1,036 home PL points), Arsenal (933) and Chelsea (929). But as our graphic below shows, 45 different teams have visited Liverpool in the PL era, and 28 of them have managed at least one win, including Barnsley, Blackpool and Watford. And among the 17 teams without a PL win there, West Ham’s zero wins from 18 games is a standout number that must surely change one day soon. Mustn’t it? As was covered in these pages a fortnight ago, about one in five regular match-goers for English league football turned their backs on the games involving their clubs in the third round of the FA Cup. 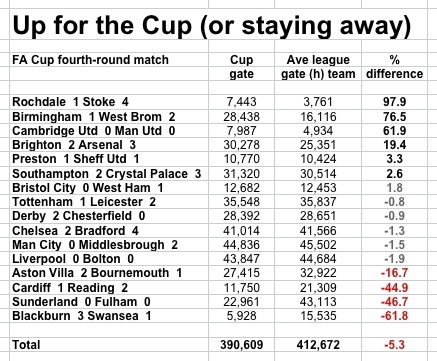 Or in other words, the home crowds for the Cup were in total about a fifth down on the home crowds at the same grounds in the league this season. Some gates were up (mostly at smaller clubs with bigger visitors) and some were much more than a fifth down. But now the fourth round has produced better news, with just one in 20 fans staying away, overall. As ever, there was a contrast in attendances at different games. Three in every five fans stayed away from the Blackburn game in spite of Premier League opponents in Swansea and a clear upset chance, and nearly one in two were missing at Sunderland and Cardiff. But then crowds at Rochdale, Birmingham and Cambridge nearly doubled and some would have done even better had capacity allowed. Crowds at Chelsea, Man City, Southampton and Tottenham held commendably steady even if the results hugely disappointed their fans. Our graphic shows clearly those clubs with red numbers showing big falls, those in black with rises, and those in grey who were not far away from their usual league gates.